We completed the second MVT Rifleman Challenge this past Labor Day weekend. Challenge II was a great event. I have photos to go through and a video to make; hopefully I will be ready to post that later this week. We had 14 competitors. 3 of those were back from Challenge I in the spring of 2015. Of the 14, 11 walked away with their Rifleman Patches. 2 of those were ones who had not met the standard (due to their 2-Miler time) last spring. 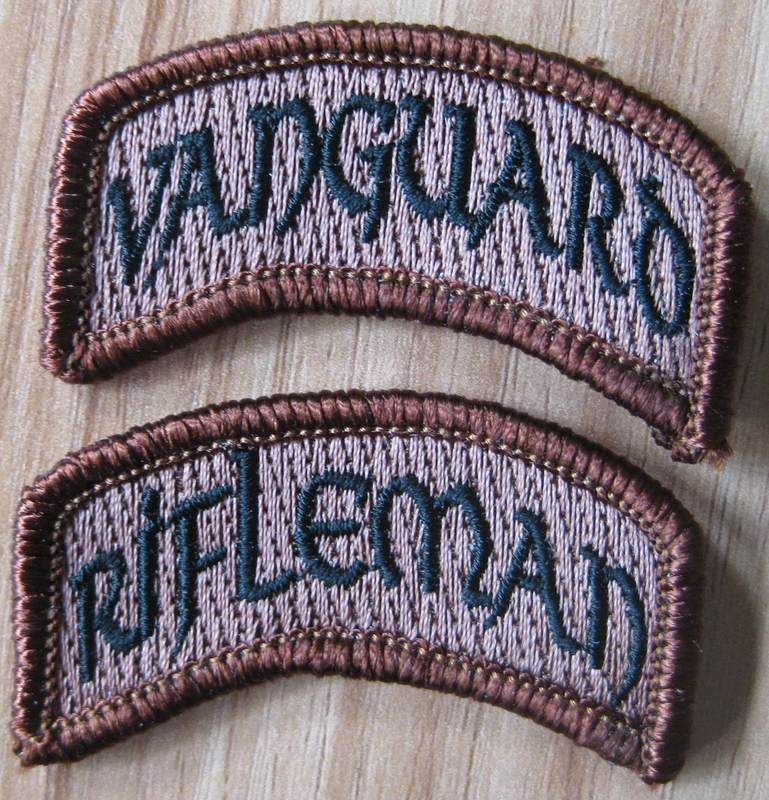 3 competitors earned the Vanguard patch due to their times on the 2-Miler. 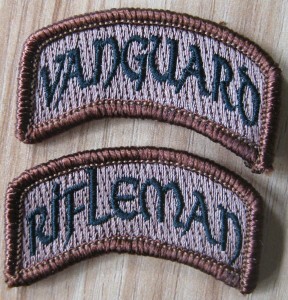 There is a perhaps a little confusion over this: the Vanguard patch is earned by running sub a set time on the 2-Miler. It does not necessarily mean you win the competition, or even earn any patch, if you do not make the standard on another event (which nearly happened!). Aaron won the 2-Miler event with a time of 22:19. Unfortunately, he had to leave on day 2, due to a family emergency, and so will be returning to earn his patch. Aaron, like Jon who won the first challenge and helped me beta-test the new route, is an outlier in terms of exceptional physical fitness, and his time is not representative. Mike Q won the competition. He did not earn a Vanguard time, but overall he placed first. This shows how the competition values a group of skills. Of the 8 pass/fail events on the Challenge, 4 are specifically scored to place people for the competition part of the event: 2-Miler time, Shoot score, Navigation time and Weapons Manipulation time. Winston earned his Vanguard patch and came second overall on the competition. In fact, Winston and Mike Q were tied for first place and we had to run a tie-breaker. Winston only began his foray into tactical training last April, with a series of MVT Training Classes and physical fitness training. Great effort! Greg placed 3rd. Wow. This guy (Dentist!) is 61 years old. He didn’t make the 2-Miler time in the spring, went away and lost 22 lbs, came back and ran a Vanguard time! He also won the Land Nav! There were 6 competitors who remained in the competition to score a place. The others, although they met the standard and earned their patch, for one reason or another knocked themselves out of the points race due to one event or another. Robert from JRH Enterprises, who sponsored the prizes with some excellent gear, won his Vanguard patch, was winning overall after Aaron departed, but knocked himself out of first place on the Land Navigation event. Diz, who designs MVT Gear, placed 5th! The 2-Miler times were adjusted to achieve the aim of the competition. I had run the course a couple of times myself, and Jon ran it, but like Aaron we are outliers, all coming in at around that 22-23 minute time. The aim if for the Rifleman standard to be a gut check, but attainable if you train for it. The Vanguard time is more of a challenge, to aim for. If you haven’t seen the course, you won’t understand, from simply looking at the times, which seem easy. On another note, you may have missed this post on the Citizen Close Combat Class (C3) and the amended MVT Class Progression. C3 has become an advanced Alumni tactical clearance (CQB) class. Combat Team Tactics (CTT) is a pre-requisite. C3 now sits alongside Combat Patrol as graduate-level alumni classes. We have the next C3 class coming up on September 26-27. Let’s stack it up with Alumni, which is what happened on the August inaugural class. See the post here for the detail. Can I get an amen? YES. It would SEEM like that’s a helluva lot of time, unless you DID it. Death Mountain, aka MF’er hill, you cannot run up, I don’t care how badarse you think you are. I came in 2nd on the 2 miler at 24:35 and that hill easily added 5 minutes to my time, maybe more. Remember, it’s about a MIX of skills, don’t be that guy (ME!) that did well on the running and gunning but totally screwed myself on the land nav. It’s those damn squiggly lines… Their is a LOT of them and you darn well better be able to interpret them correctly and quickly. I diddled my time on the land nav course away and missed points cause I “assumed” (you know what that makes me) I was on a draw that I was not on. Pulled my head out of my rear later and passed, but could have won had I not screwed that up. More importantly- I might have missed a rally point, a cache site, etc. if it was for real because I was on “the other draw” 100 yards over from the CORRECT draw. 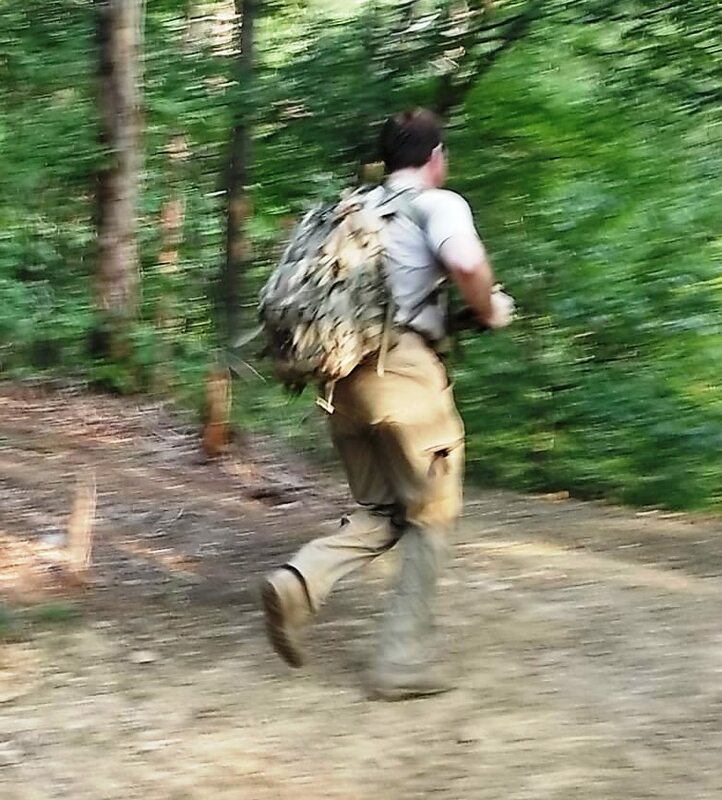 Folks, this is why we train. Better to fail in training than in real life. I would highly suggest going to a Rifleman Challenge. You can either KNOW or you can THINK YOU KNOW. When something happens that we need these skills, you will need to KNOW, not THINK you know. Hats off and congrats to all who competed with a hardy round of applause to those who earned their patches….especially Vanguards. Looks like you had a class that was all in reasonably good shape,with many in above average shape. Great job to all who attended and earned their patches! “Looks” can be deceiving. You really have to attend to know where you stand. Thanks to Max, 1st Sgt, and all alumni who assisted in this event. It was excellent training as well as a test and competition. 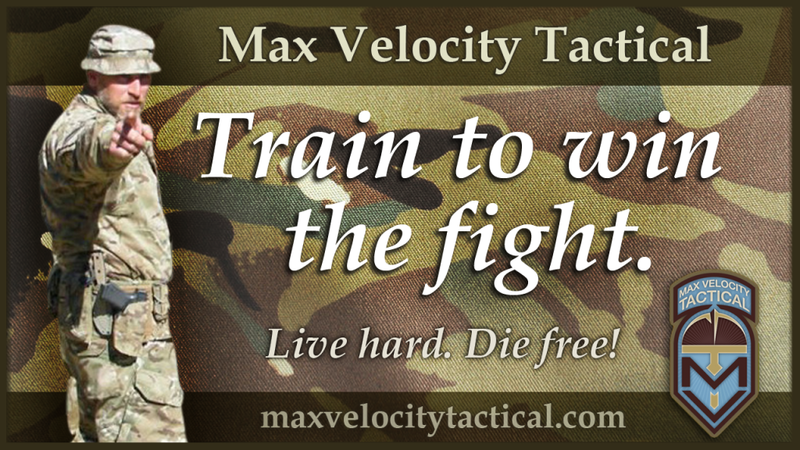 I don’t know what else to say other than you will not find more realistic training and a test of your mettle. Good job to all who attended and competed. It was an honor to train and compete with you. To all of you who may be thinking about attending. If you are serious at all about being prepared for uncertain times, you need to do this. More to come. When is the next Rifleman Challenge? I have so much work to do but would really like to compete and prove my worth. You rock Rob & Tater! and congrats to all! April 2016. Exact dates TBD. Tip of the cap to all the attendees.